A few years ago, I had the pleasure of meeting Steven Machuga, who has a background in charity work for members of the military. Machuga recently founded Stack-Up.org, a military-focused charity to realize his vision: bringing happiness and peace to deployed members of the military through care packages that feature video games. Video games have been shown to help relieve stress, and provide soldiers with a sense of escape from the day-to-day hazards and stresses of deployment; Machuga credits them heavily for maintaining his own mental wellbeing while deployed on duty. I caught up with Machuga at this year's E3 convention in Los Angeles to learn about what he's learned, what his goals for the charity are, and other fascinating insights into the life of a charity founder and military veteran. Below is my interview with Machuga. JD: What exactly is the nature of Stack-Up.org? What do you guys do? SM: We are a military charity that supports US, NATO and ANZAC (Australian and New Zealand) Veterans through gaming; not just video gaming, but board games, collectable card games, role playing games; if it's designed to entertain, it's our job to help get it into the hands of troopers. That's the simple conversation. However, we're not just about providing entertainment for soldiers and sailors: there are a number of medical studies out detailing the benefits that individuals get from gaming, such as emotional and physical pain relief, reducing stress and depression, and combatting post-traumatic stress disorder in combat veterans. JD: What made you decide to start it? Is there a reason behind the name you chose? I started Stack-Up because it was my way to continue my service to the military since I can no longer put on the uniform and get off the bench. When I was deployed to Iraq, our Infantry battalion received a crate full of third-hand harlequin romance novels from a library. As a bunch of guys, we ended up using them for target practice on the confiscated arms range. It was right then and there I realized that folks back home wanted to help out the troops, but it generally turned into the equivalent of a fifth-grade canned food drive: grab whatever dented can of yams you have in the back of the pantry and bring it in, but at the end of the day, you end up with 26 dented cans of yams, and are you really helping? As someone who used video gaming to mentally survive his deployments overseas, I wanted to share that relief with other service men and women. As for the name, Stack-Up, a "stack" is a slang term for a formation used in military or law enforcement, when an assault team forms up single file along the entrance or doorway to a room where they believe a threat is located. 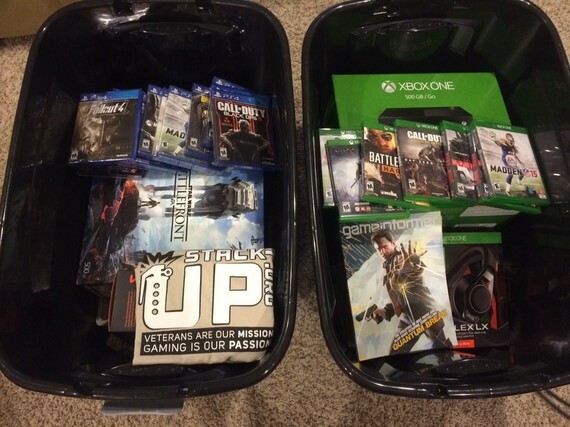 For the charity, the stack represents a strong community of friends, family, brothers and sisters in arms, and supporters, all coming together for a common mission, and here, that's supporting veterans with video gaming. JD: How are you different from other charities similar to yours? What sets you apart? We're the only organization out there focusing specifically on supporting veterans specifically with video gaming. 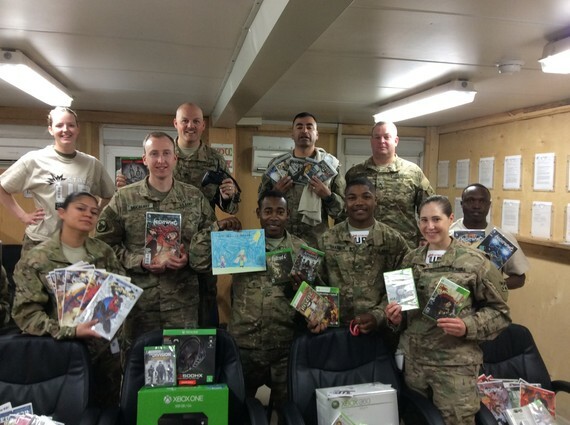 There may be other organizations out there that send gaming consoles or board games to veterans, we are tied into the gaming industry and working with them to interact with their military fans. JD: What are some examples of the way Stack-Up has directly affected the lives of those you are trying to reach out to? The thank you emails and cards we get back from the veterans that we get are awe inspiring. To know our supply crates full of gaming gear have changed the direction of a unit's deployment overseas; it's one thing to get a box of baby wipes and wet naps, but you unbox thousands of dollars in the latest and greatest in video gaming? It becomes the high point in an individual's time deployed forward. We've had units request our crates after suffering horrific losses on the battlefield, and their sending back pictures of a platoon setting up a Call of Duty or Madden tournament? It reminds you why you got into the charity business in the first place. JD: Would you say Stack-Up affects not only the lives of veterans, but also those of the people that work for and volunteer for you? How? Many of the individuals who are volunteering for us are prior service military or gamers who never served but feel compelled to help. When veterans get out of the service, they quickly find themselves out of their routine and no longer among individuals who understand what they've been through. With gaming, they find they can share a common language with gaming civilians. And a lot of them believe in our mission because they feel the same way I did when I was deployed; they used gaming to get by wherever they were at and understand what a good game can do for you, and want to bring that joy to others as well. On top of that, we've got a fun gaming community around the charity as well, so it inspires folks to not only volunteer locally with our "Stacks" program, but gets them coming back into our chat and voice clients and hanging out with one another. JD: What qualities do you look for in your leadership team and in the people that you work with on a regular basis? Initiative. I'm finding as Stack-Up grows, I literally can not do everything. I need my people out there beating the brush and coming in from angles I wasn't expecting. I'm losing count of the number of times my folks have come to me with random opportunities from directions I never would have even looked into. Watching them getting after it also inspires me to work harder and prove I can keep up with them as well! JD: To date, what is your greatest victory within Stack-Up? We've made some pretty impressive wins throughout the course of this year, but our 20 volunteer team descending on the Electronic Entertainment Expo in Los Angeles was, so far, the highlight to beat. A sea of our red-shirted volunteers sweeping across the show floor, spreading the word of the charity, supporting the deserving veterans we sponsored to attend, everyone having a great time. Now the goal is to beat it for next year! JD: What is Stack-Up's greatest struggle? The charity fundraising game. We do a lot of great work, but the amount of time and energy that gets eaten up chasing after the slightest opportunity for donation dollars is exhausting. You can start to see how easy it would be for a charity organization to allow its entire year to get dominated by year round fundraising and administrative minutae. JD: Have you had to make any difficult decisions regarding Stack-Up? If so, what was the most difficult one and what did you do? When you're running an all-volunteer army, every hour you get from an individual is a blessing. That person could be out spending time with their family, working on their degree, building their own legacy or organization, and instead, they have chosen to follow our banner. It then becomes difficult when one of them starts going a different direction or not doing what you're asking of them in a timely fashion to NOT put a finger in their chest and start telling them how it's going to be. One of our first leadership staffers had some serious "does not play nice with others" issues, causing problems across the charity and demoralizing everyone. But he was a dedicated volunteer who was 100% devoted to the cause. It was tough having to let them go, but when they were gone, you could almost see the entire charity breathe a sigh of relief when things stabilized. JD: Do you plan to use more than video games to help disabled veterans in the future; board games, card games, tabletop, etc.? Absolutely. We have worked with Wizards of the Coast (Magic the Gathering and now Dungeons and Dragons) to get boxes of cards in our supply crates, as well as manuals and handbooks for tabletop gaming. I would have loved getting into a six-month long Dungeons and Dragons campaign with my team while I was in Iraq. JD: Where do you see Stack-Up in five years? Ah, everyone's favorite question. Stability. We're a new organization out there trying to do some good while paying our staffers not nearly what they're truly worth; I'd like to not be looking at the ledger every month and wonder if we're going to have to cut back or scale down. I'd like to be able to expand our outreach truly internationally with teams in Europe and Australia. JD: Where does most of your time within the organization go? Emails and conference calls. It's a damn shame, but between talking with my team or setting up new deals for the charity, it's chews through my day in nothing flat. JD: How does running a charity such as Stack-Up make you feel at the end of the day? You know how they say that if you love what you do, you never work a day in your life? I work at least 10-12 hours a day, seven days a week much to the chagrin of my wife, but I wake up every morning, crack my knuckles, sit in front of my computer and can't wait to help out veterans.